ACS Commissioner David Hansell’s recent column for City Limits is only the latest example. The agency regularly cherry-picks data to disguise the fact that, under Hansell’s leadership, ACS has retreated from reform and subjected more children to the enormous trauma of needless foster care. Consider the matter of time frames. When it suites him, Hansell is willing to go back decades, in effect taking credit for the accomplishments of others in reducing the number of children in foster care on any given day. Hansell also wants us to believe that ACS resorts to “emergency” removal only in the most serious cases. Yet in 20 to 25 percent of such removals, as soon as ACS has to make a case in court, the judge throws it out and sends the child home. Consider the implications: The very fact that ACS already has taken the child stacks the deck. ACS has had at least 24 hours to build a case. The judge need find only that it’s slightly more likely than not that abuse or neglect occurred to hold the child in foster care. And the judge knows s/he will be all over the New York Post front page if s/he sends the child home and something goes wrong. In spite of all that, judges still send the children home in hundreds of “emergencies” that really aren’t. To hear what a typical so-called emergency is like, listen to this edition of NPR’s Latino USA, starting at 17:05 in. As for the pious proclamations about removing children in emergencies to keep them safe, that ignores the multiple studies finding high rates of abuse in foster care itself. It also ignores the enormous psychic trauma – the same sort of trauma endured by children taken needlessly at the Mexican border. Worse, these kinds of removals often are the ones for which it is likely to be hardest to find a placement right away. 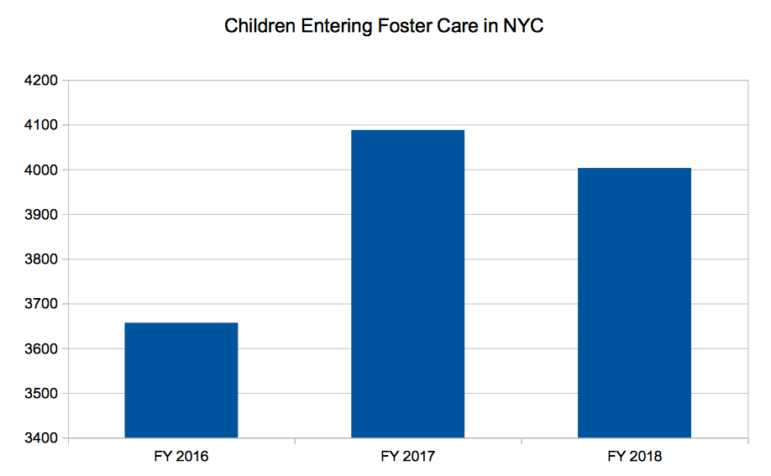 So these children are among those most likely to wind up warehoused at the Nicholas Scoppetta Children’s Center – which NBC New York just exposed as rife with abuse – in part due to overcrowding. Hansell plays the same “I gave back some of the money I robbed” game with cases in which ACS hauls a family into court to try to place it under “supervision.” He writes that in 2018, the number of such cases “decreased by 20 percent from 2017.” Perhaps. But in Fiscal Year 2017 such cases skyrocketed by 50 percent over the same period in 2016 – and again, the number stayed just as high in Fiscal Year 2018. So again, even if there was a decrease toward the end of 2018 – and page 8 of this document from ACS suggests there was, it still means the number of families forced to jump through court-ordered hoops has soared since Hansell began running ACS. This isn’t the first time Hansell’s ACS has provided data that are, at best, incomplete. The increase in emergency removals was one result of a foster-care panic, a sharp, sudden increase in children torn from their homes after a high-profile child abuse fatality – in this case the death of Zymere Perkins in September, 2016. Speaking on WNYC’s Brian Lehrer Show on Aug. 11, 2017, Hansell denied there had been any overall increase in removals at all. That wasn’t true. Then ACS admitted that, yes, there was an increase, but only at the same rate as the increase in reports alleging child abuse. That wasn’t true either. As the Mayor’s Management Report shows, removals increased at a higher rate. Every chance he gets, large and small, Hansell tries to spin the data. So he tells us that “in 2018, removals happened in 2,060 investigations.” Unless you read it carefully, that sounds like 2,060 children were removed from their homes. In fact, in CFY 2018 the number of children removed was 4,000. So there is some poetic justice in the fact that one of the cases of neglect at the Children’s Center was so horrible, and ACS failed to respond for so long, that a family court judge finally held Hansell in contempt. That’s only fair. ACS’ penchant for spinning data reveals that the agency has been treating us with contempt for years.